#GivingTuesday is only a couple months away, and November 27th will be here before we know it. Now is the time to start prepping. What does your organization have on the docket? After six years of #GivingTuesdays, the Campbell & Company team has learned a lot about what works (and what doesn't) when it comes to this day of global giving. 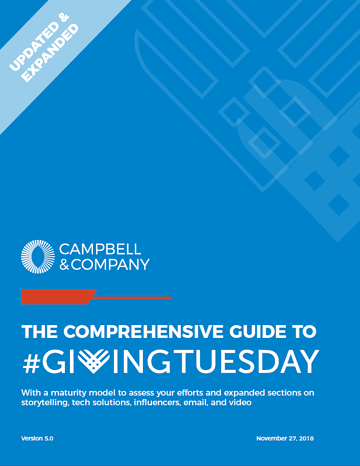 Download the Comprehensive Guide to #GivingTuesday to get started on your giving day prep. We published our first #GivingTuesday toolkit in 2014 to help our mission-driven friends as they prepared for the big day. Since then, we've updated the guide each year to include more details and tactical tips. Don't hesitate to contact me with specific questions as you begin prepping. We wish you and your organization all the best on November 27th! Kelsey Nelson is a Consultant at Campbell & Company. Kelsey’s passion for nonprofits drives her efforts to help them achieve and sustain growth through the power of philanthropy.